St John of God runs hospitals, home nursing, disability and social outreach services across Australia and the Asia-Pacific region, and is one of the largest non-government hospital operators in the country. The Western Australian-based Catholic organisation has been in existence for more than 120 years, with 23 facilities and 3000 beds. As well as delivering 12,000 babies in Australia and overseeing 300,000 patient admissions in 2016, the group is one of the largest non-government employers in WA, with more than 13,000 staff. 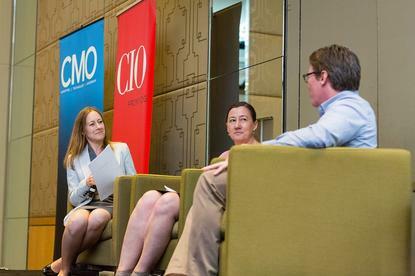 Speaking at the recent CMO/CIO/ADMA Executive Connections event in Melbourne, St John of God Health Care group manager of marketing and corporate affairs, Sally-ann Parker, said the organisation’s purpose is to provide ‘whole person’ care, with a focus on emotional as well as physical well-being. The decision to overhaul the external-facing website as well as intranet was driven by several factors. The first was the need to improve brand awareness outside of WA. “We’ve also grown significantly since the group was pulled together in the late 1980s, something that equates to a lot of change as well as a lot of uncertainty,” Parker told attendees. The group’s executives had realised that although the organisation was growing rapidly, it hadn’t put the same focus into technology or analytics. Many operations were still federated, and a more unified approach to systems and content was required. “There was also a desire to put greater emphasis on information analytics to inform decision making, to improve the way the organisation can focus on the whole person experience,” Parker said. In addition, external market forces, such as commercial competition, a sluggish economy and increased pressure on funding, reinforced the need to keep investing for sustainable growth. Put that together with an out-of-date website and on an unsupported platform, and a new strategic priority was introduced: To significantly increase investment into analytics and technology. St John of God’s new website went live in December 2016 and was two years in the making. Based on the Sitecore platform, the organisation worked with digital partner, Precedent, on implementing the technology as well as designing the digital experience. “We wanted a shared vision for online presence across all hospital and divisions, wanted a single system to connect content, marketing and systems in one place, wanted an emotive, visual design centred on our users and illustrate brand vision and values, and a personalised experience for every consumer interacting with St John of God,” Parker said. “It had to include relevant and useful content that’s easily published, reused and shared, and one-way development of online functions that improved the patient journey. Given the diverse stakeholder base and deep patient needs, it was vital St John of God go with a bespoke, user-centred design platform, Parker said. So St John of God and Precedent embarked on an extensive discovery phase, kicking off with qualitative interviews with 60 stakeholders including the group CEO, board, trustees, doctors, plus government and healthfund partners. Using Precedent’s treejack tool, teams plotted out scenarios of how patients, doctors and stakeholders would navigate through the new website. From there, live tests were conducted with consumers and patients. While significant amounts of content were written by the in-house team, Parker said the need to introduce a new services section meant reaching out to the wider business around content, and 250 subject matter experts were identified to talk to. Many were not direct employees, but doctors and researchers operating out of its facilities. Precedent digital services director, Dan Baker, said one of the surprises during the consultative process had been the level of ease engaging with practitioners. Precedent also conducted technology testing and auditing to ensure the website could be integrated with other back-end systems in future to provide a more holistic patient experience, such as clinical management and hospital systems. Initially, both the website and intranet projects were to run simultaneously, but the team quickly realised it was too complex to run both so pushed back plans for the intranet relaunch. Parker presented frequently to the management committee and leadership group as things progressed. There were also internal advocates on the steering committee, with a vested interest, who were involved in decision making and accountability. “We also had a working group with people that could be powerful change agents, and there was training both on the Sitecore platform as well as writing for the Web,” Parker said. Arguably, the biggest game-changer for marketing hasn’t been the website work, however, but the shift in how St John of God views digital as an organisation. Parker said as work commenced, it became obvious that there was a piece missing in the puzzle: A comprehensive digital strategy. St John’s marketing team is now working with Precedent to build out that strategy, engaging heavily across all business divisions as well as the IT function. A recent restructure also saw two executive-level positions introduced: IT and analytics. “Already, people are starting to think differently about the way that we work,” Parker said. “And IT wants our strategy to be the foundation for the whole of organisation. “We’ve done a huge amount of work mapping out the patient/customer experience. We have never done that before. We have been focused on the idea of whole person care but it’s been very much the care when the person came in and out of the hospital, not from the broader journey perspective. Next on the priority list are delivering the digital strategy, as well as rolling out the new intranet. There are also plans to develop the personalisation maturity model for the external-facing website, gain greater adoption engagement, start producing campaign microsites, as well as rollout pre- and post-patient admission trackers. A whole piece of work also needs to be developed around better understanding patients and customers and integrating the digital and physical journeys, Parker said. If there’s been one big lesson learnt along the way, Parker said it’s the need to keep pushing through. Another lesson is the importance of working closely with finance, Parker said, and finding early adopters from across the business to help drive change. “I think marketing people are really good at imagining the future and envisaging future possibilities, but there are lots of people in the business world who need to see it, touch it and feel it,” she commented.